FairLifts arranges skilled Florida Pipeline Inspections, surveys, and patrols in Florida to identify problems, leaks, construction excavation, or erosion. Working with a global network of helicopter operators, we guarantee cost-effective and capable service by delivering detailed, GPS-encoded, images of damaged areas in order to address repairs immediately. In some areas of Florida, pipeline inspections, surveys, and patrols may be carried out on the ground, however, in rugged and remote regions that are inaccessible by land, aerial helicopter pipeline inspections provide safe views of lines at lower altitudes, where aircraft can land or hover to capture high-resolution images. Florida is one of the largest energy-consuming states, though its per capita energy consumption is among the lowest. The state's northern panhandle contains Florida's largest crude oil and natural gas field, which is supplemented with abundant renewable resources. The transportation sector has the highest energy demand, followed by the residential sector. Florida produces an estimated 5,000 barrels of crude oil per day. Nearly 90% of Florida's petroleum is consumed by the transportation sector as a result of Florida's tourism industry, as well as heavy passenger and cargo traffic through its international airports. Electric utilities are powered with natural gas-fired units. Most of the state's natural gas production comes from the Jay Field in the Florida Panhandle. Florida receives most of its natural gas supplies from the Gulf Coast region via five major interstate pipelines. Two pipelines run along the Gulf Coast entering Florida through Alabama, two enter through Georgia, and one runs underwater, forming a direct link from Mississippi and Alabama to central Florida. FairLifts works with a global network of helicopter operators to provide skilled pipeline inspection, survey and patrol solutions for the oil and gas industry in the state of Florida. 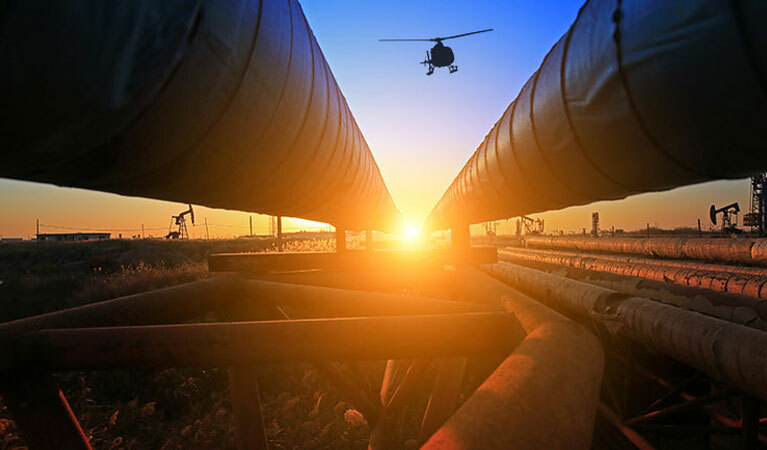 Expert pilots ensure safe, timely and cost-effective pipeline inspections and surveys, cargo shipments, emergency response, leak location assistance, and crew transport. FairLifts manages helicopters for regular pipeline inspections and surveys to identify leaks, anomalies, damage or erosion. Working with a global network of operators, we provide helicopters fitted with sensor light detection and ranging (LIDAR), which are integrated into a Geographic Information System (GIS) to analyze and evaluate images and GPS information immediately. FairLifts manages helicopters for pipeline cargo shipments for logistical support, isolated facilities, pipeline construction, oversized loads and precision long-lining for large drill rigs and pipeline infrastructures. Working with a global network of helicopter operators, we deliver immediate solutions to keep vital oil and gas industry operations up and running. FairLifts manages helicopters for emergency response and leak location assistance to respond immediately to all emergency medical situations at offshore and onshore oil and gas sites, as well as leaks or damage, to safeguard crew and staff. Working with a global network of helicopter operators, we deliver medical staff and equipment to ensure life-saving service, as well as repairs. FairLifts manages helicopters for crew transport to offshore and onshore locations for production and exploration operations, ad hoc supply and equipment delivery missions, emergency flights, freight and cargo services, and executive tours. Working with a global network of helicopter operators, we provide essential helicopter transport for the oil and gas industry. Contact one of FairLifts' knowledgeable account managers 24/7 to schedule professional helicopter services, as well as to request quotes or additional information regarding Florida pipeline inspections, survey and patrol solutions.